Princess Posey is back in another sweet adventure. 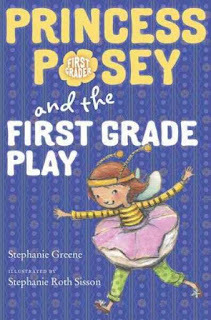 From her first days of first grade, faces the challenges and fears of a new school and new routines, Posey has progressed through the small triumphs and travails of school and is ready to tackle a new adventure. Posey and her class are studying bees, which she loves. She also loves her classmate's special bee eraser. She doesn't love not being picked to be the queen bee and doesn't see why Caitlyn should have everything. In a moment of weakness, she takes the special bee eraser. What will she do now? Sisson's gentle charcoal illustrations capture the small joys and sorrows that loom so large in Posey's life. 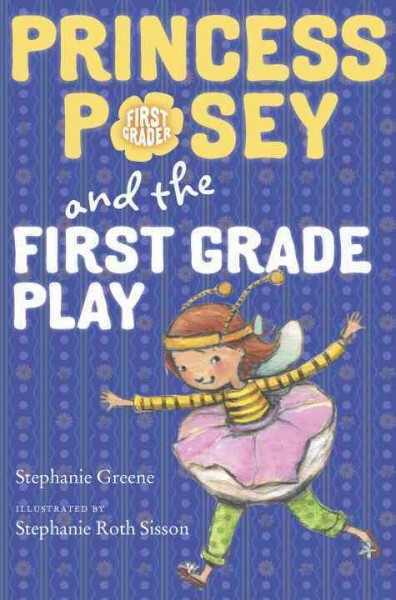 Posey's struggle to be content with what she has, her mom's firm but kind lessons on not getting everything Posey wants. There's small dramas, emotions, and humor in this sweet, cheerful story. While I would like to see more diversity pictured than just the make up of Posey's classroom, in general this is a pretty typical picture of the average classroom in our area and girls do relate to Posey's life and stories very strongly. Verdict: I'm still regularly recommending this series to families who want the slice of life introduction to school but don't like the attitude or bad grammar of Junie B. Jones. I have no personal feelings either way myself, except for a private feeling that class clowns like Junie B. are annoying, but this series continues to offer a nice expansion of our collection. This was an odd story. 6th grader Daniel Kendal doesn't fit anywhere. 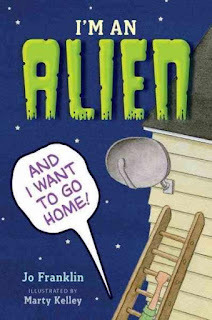 He stands out - literally - in his family, has no friends at school except weirdo Eddie and Gordon the geek, and his nasty older sister just told him he's an alien! With the help of his friends, he decides to go home to Kepler-B, the planet he's sure he came from. With his friends' help, he tries to prepare for space travel and contact his true family. However, after a series of misadventures and a truly catastrophic Halloween, Daniel is starting to suspect he may have made a mistake. The book comes in under 200 pages, which is great - there aren't many books for older elementary readers that aren't massive tomes - but it's very uneven writing and the black and white pencils illustrations feel too young for the intended audience. While the characters wildly swinging from maturity to naive innocence is, perhaps, realistic, I found it hard to believe that a 5th grader could actually believe they were an actual alien. One minute they're discussing whether or not Daniel is an alien and the next they're flipping each other off and doing complicated technology on computers. I would have found it more believable if Daniel's horrible sister had told him he was adopted and he and his friends had investigated that. Daniel's family is kind of horrible. I can see why he'd hope to be adopted - his parents are oddly cavalier about his health and welfare and his sister is a really unpleasant person who never suffers any consequences. The book was funny in parts, but overall I just didn't care for it and I can't think of an audience for it at my library. I've been longing to see this book ever since it came out. I love de Monfreid's illustrations in various quirky picture books, especially I'd really like to eat a child and I was interested to see how she handled a board book format. 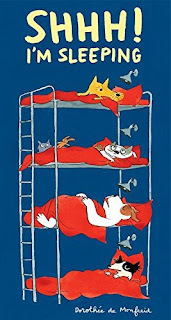 The book is formatted into a tall rectangle, and on each side of the spreads are metal bunk beds, as seen on the cover. The first spread shows a darkened room. Only one dog is awake and her frustrated eyes are clearly the result of the interesting noises emanating from the 2nd bed on the left (that's the white and brown dog on the cover if you're interested). The lights pop on and one by one the dogs switch beds, chat, and join a friend on the other side for a story. Finally, the night is over, Popov (the noisy dog) awakes, and wonders why everyone else is sleeping on one bed! Monfreid's illustrations, washed in the blue light of night-time, are sweet and funny at the same time. Each dog has a distinct personality and drawing and there are little details like reading lights and stuffed animals to add interest. Verdict: The plot of this is a bit complex for a baby or toddler, and the odd, tall shape may be difficult to fit on a shelf, but there will definitely be a small but appreciative audience and I recommend adding it if you are looking to diversify your board book collection. I think I shall make a collection of picture books featuring knitting. Wide-eyed Cat loves his new friend, Yarn. Together they play games and have wonderful adventures. But then Girl takes Yarn away and when he returns, he's different. Will Cat and Yarn ever be friends again? The story itself is funny and clever, but the real genius lies in the melding of art and story, especially in Cat's expression. 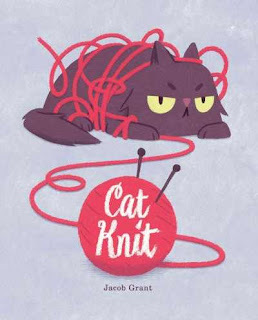 Cat's innocent enjoyment, sulking when his friend is gone, and outrage when Yarn returns in a different form will make readers and listeners giggle from beginning to end. The simple, bold text could also double as an easy reader and this is a good choice for storytimes or reading alone. 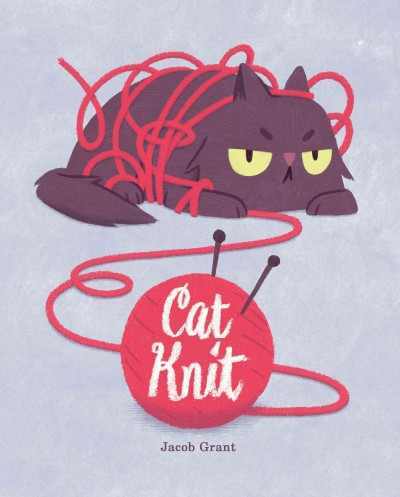 Verdict: Hilarious, even if you don't knit or like cats. Recommended. In 2016, while weeding the juvenile nonfiction, I hit our majorly outdated weather section. "Nobody ever wants juvenile weather books" I thought. "I will get rid of the detritus and add new materials at my leisure". Guess what? The school has a new curriculum. They want lots and lots and lots and lots of weather books at all levels. I am getting new weather books now. Fortunately, various review sources came through for me with lots of possibilities. I'm look at two very different titles, at different levels, from Penguin imprints today. When the sky breaks, by journalist and adult author Simon Winchester, is aimed at strong middle grade readers. It explores storms, especially tornadoes, hurricanes, and other extreme weather, the science behind how they are formed, effects of climate change, and more. Extensive back matter supplements the already impressive amount of knowledge packed into the book. This book feels like a backyard enthusiast wandering through an interesting collection of facts and knowledge - which it largely is. Winchester talks about everything from his personal collection of barometers to weather phenomena in the Pacific ocean, including the economic and personal effects of weather along the way. 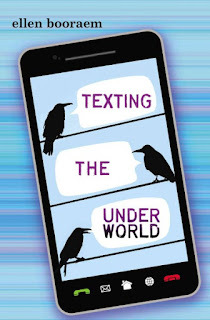 For younger readers, Penguin Core Concepts has a simpler but more organized approach. Warning: Wild Weather Ahead covers a lot of the same concepts but in simpler, more abbreviated form. Each spread covers a different phenomena; the water cycle, tornadoes, rainbows, etc. with a few extra facts on each page. There are no sources for these titles and they are illustrated with standard photography and have a simple, square layout. Beginning to intermediate readers will be able to tackle these "nonfiction storybooks." Verdict: I would say these are both supplemental texts. 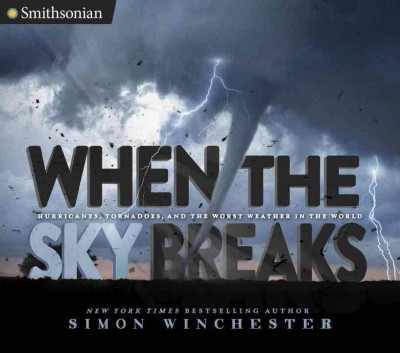 When the sky breaks will appeal to strong readers who are interested in science and weather and want something that will spark off ideas for further research and exploration. 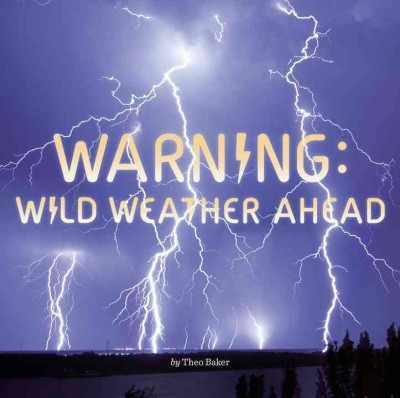 Warning: Wild Weather Ahead is a good starter text for younger readers; the main drawback is that it is available only in paperback. If, like me, you are trying to rapidly expand a subject area I recommend both, although I am waiting to see if Warning: Wild Weather Ahead is available in prebind. I have a sinus infection and big-program-hangover. People continue to put things on my desk. I don't know why. This is one of the new series I added to our beginning chapter series this year. Angleberger teams up with Bell to present a ridiculous mystery series full of wacky problems and even sillier solutions. Inspector Flytrap of the Flytrap Detective Agency only takes on really BIG problems. Fortunately, there's no shortage, from a mysterious art clue to a giant stinky shoe. Along the way Inspector Flytrap has to deal with his assistant, Nina, eating the clues (she's a goat), clients who don't appreciate his genius, and all manner of craziness. The illustrations are in black, green, and gray with photographs in collage format. 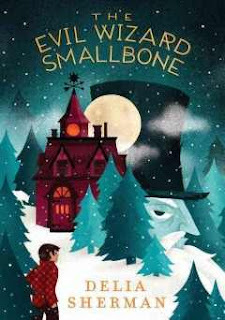 The text is a good match for intermediate chapter book readers, not quite as challenging as Magic Tree House, but harder than an easy reader or Branches title. The mysteries are, at best, peripheral to the silly jokes and hijinks that fill the story. Nina eats evidence, Inspector Flytrap muses on his need for movement and excitement. A giant peg-legged pirate appears, Flytrap and Nina eat lunch from the garbage. 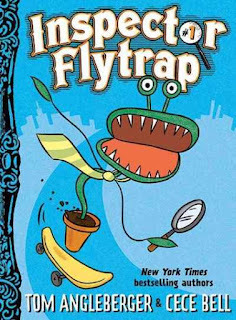 The story ends with the last case, involving a missing rose, which turns out to be the perfect partner for Inspector Flytrap! Verdict: I thought kids would enjoy the wacky humor of this series and it had ok circulation. 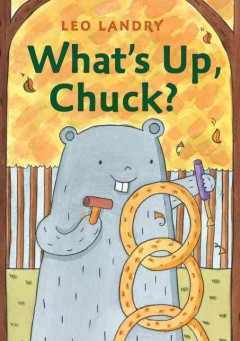 When I used it in book club several kids were interested and liked the idea of the silly story. I don't think it will be a super popular title, but if you have a large beginning chapter collection it's a good addition. This dramatic story, based on true characters and events, grabs the reader immediately and promises great things for a new series. 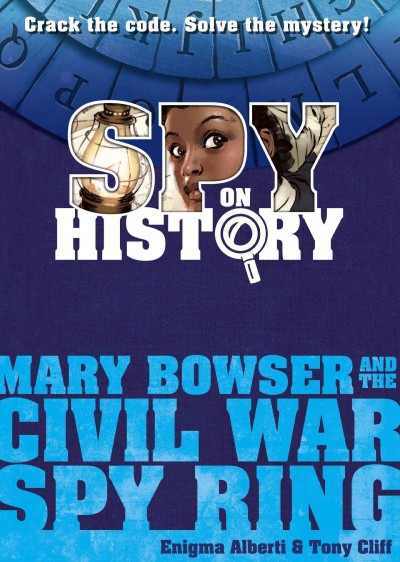 This is the story of Mary Bowser, ostensibly an illiterate servant in the house of Jefferson Davis, in reality a clever and determined spy. She braved incredible danger, living every moment in suspense, to pass information to the Union forces. This book takes the few facts known about her life and expands them into a fast-paced spy story with graphics, historical context, and a pulse-pounding conclusion. The book includes biographical information about the characters of the story, an historical note, and a bibliography. There is also an answer key to the multiple mysteries included throughout the text. I reviewed this as an ARC; it's apparently going to include multiple code-breaking pieces, similar to Candlewick's -ology books, as well as graphics in color. This book contains some things I have been looking for and some I have not. I'm thrilled to see more historical fiction and narrative nonfiction (this book is a crossover of both) that features diverse characters, the people often passed over in major historical narratives. As a librarian, I'm a little nervous about books that include Things though. How long will they last? Will we have to count them every time they come back? I postponed this review until I could borrow a copy of the finished book from another library. The finished copy has more art, both in color and black and white. The only loose pieces are in an envelope at the beginning of the book. They involve a couple code-breaking items and a little pamphlet. The story is still good without them and I wouldn't worry too much about them disappearing. Verdict: Despite my reservations, I foresee this series being very popular and it definitely fills a niche. 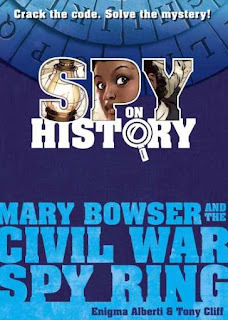 Hand it to fans of I Survived, Magic Tree House, and the -ology books and watch kids become immersed in history. This is part of a new series I haven't previously looked at - All Aboard! Each previous title takes the reader to a different state or large city. This one is a bit of a departure as it takes readers through various national parks. Each spread is labeled with a different activity in a different park. One spread shows the train passing by a geyser, with a row of observers and a few bison in the background. This is labeled as Yellowstone. Against a vivid pink and yellow sky, a mountain goat stands on a ridge and an orca leaps in the ocean of Olympic. 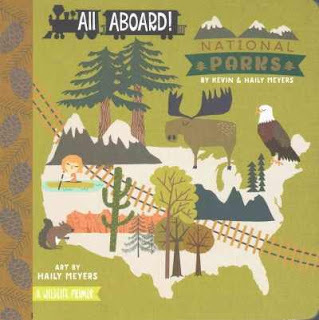 Each spread has one animal identified with a label, the name of the park, and the train somewhere in the illustration. There is enough detail in the illustrations to catch the interest of older children and larger items for younger listeners to focus on. There are people pictured in a few spreads and a few have darker skin but most are white. The illustrations are a little rough around the edges; they sometimes look as though they are collages that weren't put together exactly right. Verdict: Although this isn't perfect, it's a delightfully unique title and manages to incorporate older concepts (wildlife, national parks, geography) in a manner that is suitable for its audience of young listeners. A little boy watches his sister read and write and then imitates her by making squiggles and doodles. She gently encourages him to turn these into a story - an I begins it, then a circle becomes a soccer ball, dots become sand on the beach, and v's are the waves. The story continues until he gets stuck and takes it to school, where he lots of ideas for continuing his story! This was shortlisted for the CLEL awards and it absolutely drips with early literacy ideas! I loved the emphasis on early writing skills, how the little boy wasn't pushed to do "real letters" but gently encouraged to use his imagination with his (developmentally appropriate!) current skills. In fact, if you wanted a manual for including the writing aspect of early literacy in storytimes and art programs, this is it! 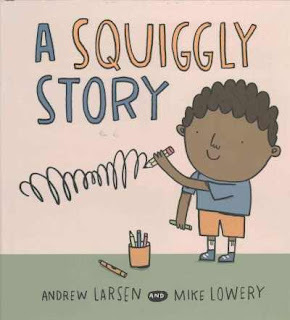 Lowery's cheerful images show a biracial family and a supportive, diverse classroom as well as supporting the text that brings the little boy's doodles to life. 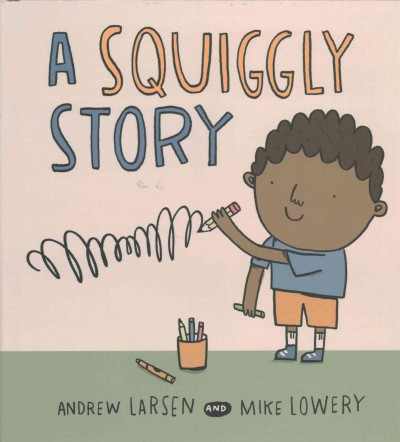 Verdict: A great choice to support writing and imagination in preschool storytimes and in classrooms. Highly recommended. Pogo is Jump! 's imprint for older readers. As I'm looking for more weather books, I welcome additions to the Disaster Zone series. These serviceable titles cover both being prepared for disasters as well as the science and causes of disasters. 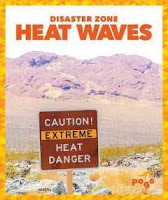 Heat Waves talks about what causes a heat wave and possible consequences, including fire and dehydration. It also covers ways to protect yourself and family during a heat wave. For some reason it's really hard to find current books on droughts, so I'll definitely need this one for some current units in our school district. How is is Made? is a new series, similar to Lerner's Start to Finish series. This one includes chocolate, crayons, ice cream, paper, peanut butter, and syrup. 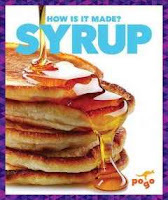 Syrup starts with the maple trees and describes the tapping, processing and preparation of syrup. It includes a diagram of the process, activity, index and brief bibliography. I have a lot of young kids (think kindergarten) who are suddenly obsessed with processes and I think this series might appeal to them. Verdict: These are serviceable series, the acquisition of which will depend on your library's needs. If you are looking for additional titles on weather and "how things work" both are good choices to add, as long as you already have more core titles like Lerner's Start to Finish or Gail Gibbons and Seymour Simon weather titles. I plunged the toilet and picked up cookies. Not at the same time. One girl mentioned she was reading Princess in Black and everyone chimed in with enthusiasm on their love for the series. Red's Planet had several fans. One thought the little blue aliens were funny. I pointed out that they're trying to eat Red, but they still thought it was funny! A couple readers are still working on Palace Beautiful. I finally got a reader for Melonhead! She thought it was funny, which of course it is! The Jake Maddox imprint (no, he's not a real person) is not exactly well-written, but I have gotten the most reluctant of readers to read them, so they're awesome in my book! 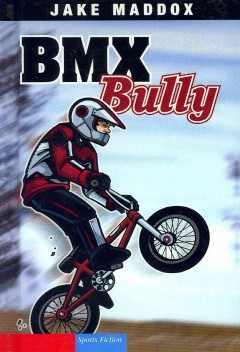 In BMX Bully, Matt is struggling with his feelings about his father being overseas and a new guy running the BMX course. This gets even worse when a cheating bully shows up - and turns out to be the son of the new owner! Matt works hard to keep his cool and play fair, even when the other kid breaks the rules and he and his dad try to rile him up. 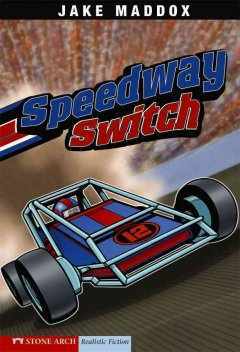 Eventually, he wins despite the obstacles and finds another track where the owner remembers his father and doesn't allow cheating. Speedway Switch features twins, Michael and Mark. One drives on the midget-car circuit and one is the mechanic. An unsafe driver causes an accident, making Michael have to sit out a whole season and Mark takes his place, although he's not a good driver. When Michael gets a chance to go up against his nemesis, what will he do? Will his dad let him race? Will he get hurt again? The Jake Maddox series covers not just mainstream sports and both male and female players, it also covers more obscure sports. I had no idea kids raced cars. I guess you have to be more of a sports and/or Nascar fan to know this! The writing is fast and choppy, although it has a mid-range lexile (blech) any kid who's ready to tackle a beginning chapter can usually make it through these. The endings are simplistic and the characters one-dimensional. But, they offer what many reluctant readers want. Exciting, blow-by-blow descriptions of sports, dramatic clashes of personality (bullies, cheating) and a happy ending. Verdict: You can pretty much buy these without ending. There are multiple different series, some at a higher level, featuring both boys and girls, and many also feature diverse characters. They come in inexpensive paperbacks or more expensive library binding. Your library should have at least a small selection of these titles for reluctant readers, sports fans, and kids who want a quick, fun read. I chose these two titles for my recent book club and all the copies were pounced on with glee. I've also gotten several extremely reluctant readers, those who resolutely refused to pick up any book, willing to read these. This slow-paced fantasy builds slowly to a not-too-surprising conclusion that still has some fun twists in it. Readers will relish Nate's slow acceptance of his new life and discovery of his own inner strengths, not only magical but of character. The setting is richly descriptive, bringing to life the solitary life of the cove and its inhabitants and the magic that always dwells just around the corner. Verdict: A powerful story about magic and inner strength. Readers looking for fast-paced action won't get into this, but a more mature and reflective audience will revel in Sherman's skill with words and the slow revelation of character that the story holds. This deceptively simple title has a lot to offer for babies and toddlers. The book opens with a simple white background, the black silhouette of a cat, and a scribble of RED. One by one, colors are added and the yarn begins to twist across the page. On the final page, the background changes to black, the cat is highlighted with a softly glowing light, and the colors are joined by white and fairly flash on the page. 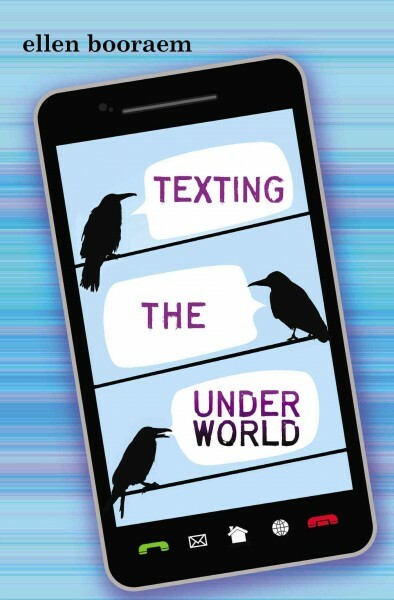 The only text is the single word denoting the added color. The font is bold and the text is in the appropriate color. Sometimes as adults, we can look at board books and think they are too simple, not enough text, not enough detail in the art, not enough stimulation for the child. But there's a real need for board books that are actually appropriate for babies and toddlers, not preschoolers or kindergarteners (or their caregivers). This fits that need perfectly. The simple, bold colors, added interactive element of colored lines to follow, both are just right for a baby or toddler to enjoy. 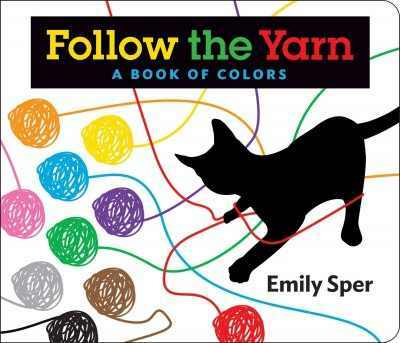 Those who need a little more plot can easily inject some imaginative play into the cat's behavior and the appearance of the yarn. Verdict: This is a new author and publisher to me and I will look forward to seeing more books from them in future. Strongly recommended. 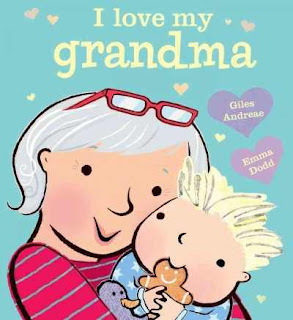 This is part of a series of family stories by Andreae and Dodd, previously published in the UK and now being published in the US in picture book and board book format. A gender neutral child with spiky blonde hair accompanies a brisk, grey-haired grandmother on adventures to the museum and on the train, baking cookies and cuddling up to watch a movie, and other fun activities. The story ends when the grandmother happily hands the child back to its mother; having enjoyed their time together, they're now ready for a break! The text is written in brisk couplets with no missteps in the cheerful rhyme. Dodd's cozy illustrations show a warm, happy relationship. The grandmother has some darker-skinned friends in one picture but otherwise there is no diversity pictured. Verdict: There are plenty of "I love my family" picture books on the market. This is sweet and cute, but does not particularly stand out among the vast number available. However, if you are looking to refresh your section and replace old titles, this would make a good addition. 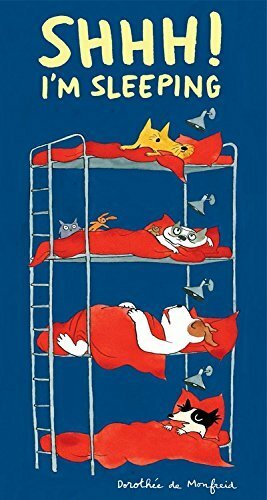 Martin Brown, the author of this delightful and hilarious collection of animals, is apparently the illustrator of the "Horrible Histories" series. I think these is more popular in the UK though - nobody around here reads them. Anyways, I didn't need to know his previous work to love this book. 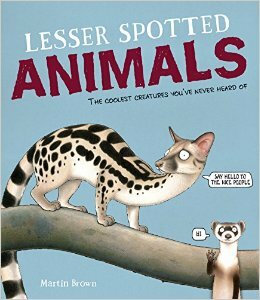 As the introduction explains, this book is all about the less popular, or less well-known mammals of the world. They might be endangered, rare, or just not a popular creature but each one gets a full spread with funny pictures, basic facts and status, and interesting tidbits of knowledge. Once you've browsed through this book, you'll know about the Lesser Fairy Armadillo, Silvery Gibbon, Russian Desman, Banded Linsang (featured on the cover), Hirola, and many more. The only back matter is a glossary and explanation of endangered status terms (least concern, extinct, etc.) so I certainly wouldn't recommend using this for research. However, it's just right for browsing. The reading level is middle grade but the text is not so dense that interested younger children won't be able to sit still for some listening. 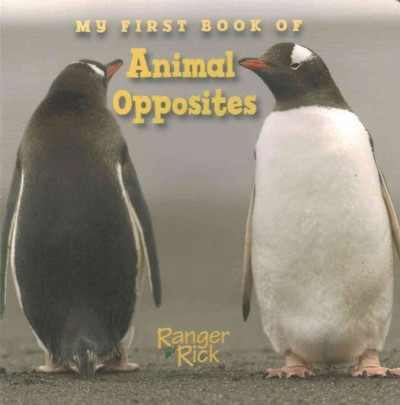 Verdict: A fun and unique addition to your animal book section. Recommended. I've always been interested in the idea of organizing picture books into subjects and I started researching this seriously in 2012-2013. I presented my ideas to our staff and, after much input and discussion, had completed the bulk of the work by the end of 2014. As I worked on this project through 2014, I saw picture book circulation increase by 4,885. My picture book circulation for 2014 reached 27,214. The Neighborhood project went through a lot of evolution. I drew heavily on the ideas of Kathleen Larson at Bloomer (and a big thank you to her for being so kind and sending me all her information), the process at Darien in CT and several other libraries who have done similar projects. We've had this arrangement for about three years now and I have had only positive or neutral feedback from patrons so far. I do occasionally get patrons who are frustrated that they can't immediately find a specific title, but I quickly pull what they need and they are easily satisfied. I had far more requests and complaints from patrons who wanted subjects (tractors, dinosaurs, potty-training, etc.) prior to this arrangement and those requests immediately died once I completed the project. It's also a bonus for collection development, as I can look at the sections and see which ones need more materials and which need to be weeded or aren't circulating. We've had a huge jump in remote collections and teacher requests and those have also become faster and easier with the books in sections. During the following years I've been carefully tracking the use and circulation of the Neighborhoods. The immediate surge in circulation died down a little bit, due in part to the shelves getting very crowded (I was unable to weed in any significant way and we added almost 2,000 more books to the area in three years, making it seriously overcrowded). I've also been able to see which areas need to be updated and shifted. While my associate updated and created new signage, I updated the area to include several new subcategories and weeded or sent to be recatalog and relabeled everything in the general favorite authors section that was not a specific character or favorite author. I have a detailed, color-coded spreadsheet which includes all our categories, sub-categories, call numbers, shortened Dewey numbers, and specific information about what goes in the categories. There are a couple things I am still not satisfied with, but which aren't practical to change. Our community category, which includes Farm, Helpers, Long Ago, Pets, and School is confusing to some. I had hoped to put pets into animals, but was overruled and people find it confusing. I'm still not quite happy with the Ourselves section, but it is shaking out more or less ok. I also would have liked a general Tales section, but I ended up putting those in either the new general Fun category or under Princesses or World. I also have a section in my series spreadsheet that covers where picture book series are located. So, if you are thinking about doing Neighborhoods, a couple things I'd suggest thinking about. First, it's a LOT of work. I did a lot of the re-cataloging myself, but our processor had a lot of work to do relabeling everything. It took over a year and was at times very frustrating and stressful. My original signage was not the best; it was greatly improved when my associate took over and handled it. Get your signage organized first. I think the process would have been simplified and improved if I'd done small sections one at a time. That wasn't possible for me, but it may be for you. I also made a utube video, which was put on Facebook, and that helped people understand the process a lot better too. This week at the library; or, I prepare! Early Literacy Outreach: Chomp! Let's Eat! Bought 4 gallons of vinegar and a large number of Peeps. You can't really order as much stuff online as people think you can. Several kids were very enthusiastic about Dragon Masters and wanted the next title in the series. I had to put copies on hold. Lots of love for Zemke's My Life in Pictures. Several girls said it was very relatable (after we discussed what that meant). We talked about a biography of George Washington Carver. The kids thought it was really unfair he couldn't just go to any school he wanted to. Notebook of Doom came in for some love from a new convert - most of the other kids have already read it, but this kid is in kindergarten so everything is new! Discussion of whether or not we'd believe our friends if they said there were balloon monsters. My super-reluctant reader had read a baseball book! And picked out Jake Maddox and two other books to read! One 2nd grader was literally bouncing up and down when they saw I'd pulled Dory Fantasmagory for a pick - apparently it's a favorite. Another kid chose Dosh Archer's Urgency Emergency because it was a favorite they remembered reading before. Little Dog Lost did not click with this group. One kid doesn't like poetry, another said they stopped reading it when it got sad. 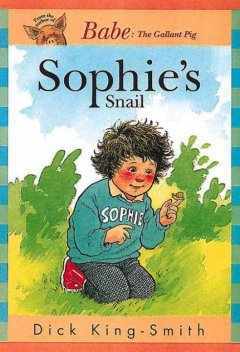 It's been many years since I read and loved the Sophie books. They are, alas, now out of print in the US. However, I was scrambling to find something for a very reluctant reader who is only interested in farming and thought that this just might click, although it's a very long-shot to ask a 2nd grade boy to be interested in the adventures of a four year old girl. Sophie is small, sturdy, and determined. And what she's most determined about is that she is going to be a lady farmer. She will have a cow, two hens, a pony and a spotty pig. Meanwhile though, she practices on the snails, wood lice, and other small creatures in the backyard. The book contains a selection of chapter-length stories as Sophie interacts with her older twin brothers, "helps" Daddy with a bad back, and has a run-in with the new neighboring girl, Dawn. This has a higher reading level than the average chapter book, and quite a few Britishisms. Sophie is a unique and funny character, and her stubborn refusal to bow to the wishes of her family and neighbors in being more ladylike, giving up her "farm" of small creatures, or overlook what she perceives as injustice will charm readers who can sympathize with adults who just don't understand. Verdict: But is it worth digging out of the back shelves or storage for use in a book club? Or looking for UK editions to add to the library? There was only one copy in my consortium (with a very grotty cover - not the one pictured), so I had to place inter-library loan requests. I ended up with about 5 copies and I think only 1 checked out. They all had the old, ugly cover though. I'm afraid this book's time has passed. It's been a long time since I read and loved Small Persons with Wings. When her next book came out, I immediately purchased it, but it's taken me a while to actually read it. Conor O'Neill is scared of spiders, bullies, his dad's disappointment if he doesn't play hockey and attend Latin school, and basically just about everything. But his fears pale when he encounters Aisling, a very young banshee who is determined to collect her "death" so she can be reborn into the world. Conor panics at the thought that she could be here for the death of any of his family, from his brash and annoying younger sister to his quirky grandfather, and struggles to face his fears and make difficult decisions for his family. This was humorous but slow-paced; the story built in slow waves to the climax and readers expecting a quick and happy resolution will be disappointed. The characters learn more about themselves and grow, but remain themselves; Conor is still scared of (just about) everything, his best friend is obsessed with technology, his dad is pressuring him to fulfill his own dreams. But Conor has learned there's more to death than he thought and Aisling, while still remaining a largely shadowy creature, has a future ahead of her. Verdict: I don't think this has the strong appeal of Small Persons with Wings, but I did enjoy the story and will probably give it a boost in the collection to see if I can save it from weeding for a few more years. There are plenty of concept board books, but this one's cheerful photographs and colored font makes it stand out. The book contains primarily animal attributes. It begins with small lion cubs contrasted with a big, adult lion. The long and short legs of an egret and puffin, a fast cheetah and slow tortoise, hard crab and soft fox. Then there is one mention of habitat - a bison lives in the cold, a lizard in the heat. Next come actions - animals go up or down, fly or walk, are in or out of the water, and ends with awake and asleep. The photographs are clear and have relatively uncluttered backgrounds. The left page photograph is bordered with a solid color, the right is a full page photo. The book is a 5x5 inch square of sturdy cardboard. Verdict: This simple concept book would make an excellent addition to, if not a required purchase for, your library's board book selections. Some popular authors stagnate, unable to move past their popular picture book characters. Others are able to grow and try new things. This has never been a problem for Jonathan London - best-known for his classic Froggy series, he's a prolific author of many picture books, nonfiction, even a middle grade novel. My personal favorites are his Hippo picture books and one of his latest nonfiction titles, Otters Love to Play. Australian author and illustrator Andrew Joyner is also a versatile creator whose retro-style cartoons decorate many picture books and his own beginning chapter book series, Boris, a popular series in my library. So, I was not surprised to be delighted and amused by their collaboration. 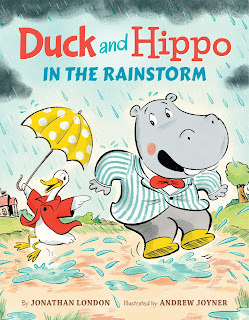 Oddball friends Duck and Hippo are out for a walk in a rainstorm. But their different sizes - and temperaments - cause some problems, especially when they run into crocodiles, a pond, and a gusty wind! Fortunately, they are both good at figuring out solutions and compromise and work together to get through their adventures and back home, safe and sound. Joyner's colorful, bright pictures are the perfect accompaniment to this classic but fresh pair of friends. Bright splashes of red, rain-washed greens, and stormy skies surround the two on their cozy adventures. The text is a little longer than I'd usually choose for a toddler storytime, but the repetition of phrases and the predictable rise and fall of the plot will hold even wiggly little ones in thrall. Verdict: Classic but fresh, this is sure to be a delightful addition to your storytime repertoire and collection - and a gentle reminder of the importance of getting along with friends. Recommended. 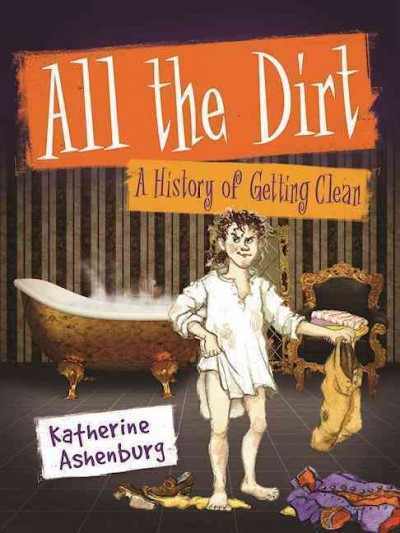 This is an interesting take on the history of bathing and getting clean. It opens with a discussion of the different "myths" surrounding cleanliness, emphasizing the cultural aspects of different modes of bathing (or not as the case may be). 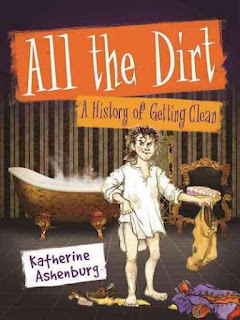 Nine chapters take the reader from ancient Greece and other countries to the rise of saints and religious aspects of cleanliness, Medieval times, the resurgence of bathing, the marketing of soap and other bathroom products at the turn of the century, and modern thoughts on bathing. While there are plenty of books delighting in the grime of our ancestors, with occasional cursory mention of non-Western cultures, this is a shift in perspective. While it includes plenty of gross facts and history, it also talks about the wider context and the way cleanliness and how it was viewed and used affected various cultures and civilizations. The book ends with contemporary arguments about cleanliness, including antibacterials and other issues. Back matter includes image credits, selected sources, and an index. Verdict: Beside the diversity of cultures and viewpoints represented, this will grab readers with its vigorous blend of colorful stories, intriguing photographs, and an excellent layout. Recommended. Originally, we had all the easy readers arranged alphabetically by author. That was it. Parents were continually asking what level their child should be reading and this increased as the local school district added four year old kindergarten and extended Scholastic Reading Counts and Lexiles to all grades. Personally, I'm against leveling, in general. However, our collection is there for the patrons, not for me! So, I came up with a compromise. All the books with a "level 1" got a red sticker, "level 2" got a green sticker, and "level 3" got a blue sticker. If the publisher hadn't put a level on the book, I just guesstimated. This satisfied parents who want to just point and say "you're only allowed to read the red sticker books" but it also satisfied my own resistance to leveling books and gave kids quite a wide range since publisher levels vary so wildly. In 2014 I added a nonfiction section to the easy readers and circulation continued to expand rapidly. We were getting good turnover for easy readers, and parents were generally finding what they wanted, but schools continued to extend use of Lexiles (A-M levels) down to younger kids and we were getting more and more requests for younger and younger easy readers. By 2015 easy readers were growing rapidly in popularity and requests and I hired an awesome assistant who had previously been an elementary school teacher. We discussed ways to better organize the easy reader section and I set her loose to work her magic. Up through 2016 Jess worked on relabeling the books more accurately, making sure each color corresponded to an accurate level. She also added an early literacy center, easy reader bundles, and new signage and handouts. I started ordering boxes of paperbacks like BOB books, which we packaged for circulation and which proved extremely popular. By the end of 2016 our easy reader circulation had increased by 3,000 from 2015. In addition to the already high demand by parents and emergent readers, the school district adopted Lucy Calkins curriculum in the fall of 2016 and teacher requests for easy readers for character studies also skyrocketed. In January of 2017 I bit the bullet and did a massive weed of the easy readers, removing all of the paperbacks (which were in horrible condition) and multiple worn, damaged, and outdated books. I am currently in the process of spending a significant chunk of budget, as well as grant money, to replace damaged and worn materials and bolster the collection of emergent readers, buying multiple copies of the titles we've found that are truly emergent titles. 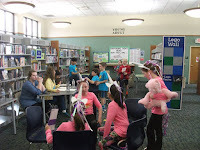 This week at the library; or, What if I did Dr. Seuss in July? Meetings and program planning. More meetings. Why are there so many meetings? Very busy. We are in an upswing of naughty teen behavior, which is always trying. It's snaining, naturally, since I have never yet done a Dr. Seuss program without snow in the near vicinity. I wonder what would happen if I did it in July? Probably a tornado. I think I said "Teens in the teen area!" a gazillion times today. And cleaned a toilet. Of course it snowed. Not heavily, but it did. Outreach Storytime: Chomp! Let's Eat! Run for your life by Lola Schaefer - we mostly just mentioned each animal briefly and then ran like crazy. I did ask the beginning as a question, "animals that eat animals are..." and all the kids yelled "hungry!" Poor little guy by Elanna Allen. This one went really well - enough knew what a puffer fish was that they passed it on to the others and they all laughed hysterically. Most of them didn't get the switch in perspective though. My awesome summer by P. Mantis - this was too old for the four year olds, but the teachers snickered. Hungry Lion by Ruth Cummins - lots of hysterical laughter and speculation as to what had eaten who at the end of the story. I will not eat you by Adam Lehrhaupt - they told me this was not scary at all, but they liked it anyways. They all decided that Theodore would eat the little boy later. One day in the eucalyptus eucalyptus tree by Daniel Bernstrom. They were very excited to note that this was a rhyming book. They must have been learning about rhymes recently. They all listened quite well to the bouncy rhythms and yelled at the end that there was a crocodile. Little Red and the Very Hungry Lion by Alex T. Smith. I don't think they got the Little Red Riding Hood reference, but they giggled at the lion's mane and were quite interested in the story. Chuck has been busy with his latest wood sculpture for the Best of the Forest art competition. He's won for three years in a row! But then Scooter shows up. He's a good artist too. And he bakes great cookies. And he's a wonderful friend. Is there any need for Chuck in the forest now? When Chuck doesn't win the contest, he doesn't react well and it takes some wise words from a friend to help him find his equilibrium again. Landry tackles the complex emotions of friendship and art in this beginning chapter book. The simple, minimalist illustrations show the contrasting styles of the two creatures' art, from abstract paintings to rough-hewn sculptures. Children will relate to the misery of feeling pushed out by a new, exciting addition to a group of friends and struggling to find their place and talents when they're not the best anymore. This is more complex than a high-level easy reader with more lengthy vocabulary as well as the book's plot. The simple pictures will keep readers' interest but the plot is a little more emotionally complex than most children's beginning chapter books will tackle. Verdict: Not for every reader, but for a thoughtful, high-level reader this is a good choice for discussion. Bera lives a peaceful and quiet life on her tiny island, accompanied by her friend Winslowe the owl. There she grows pumpkins for the troll royal family and is content. But then one day she finds a strange creature...a human baby! Where did it come from? What will she do with it? 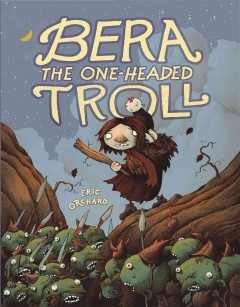 Bera isn't used to dealing with complicated problems like this and the small creature is rather gross, but she can't just hand him over to the evil witch so she does on a quest to find his family. One by one she meets her heroes, the great trolls and heroes of legend, and one by one discovers that there's both more and less to them than she read in her books. Orchard's dark and quirky illustrations are the perfect accompaniment to this odd and often gruesome story. Goblins, trolls, rats, and wolves populate the earth-hued pages in oranges, browns, and swamp greens. Verdict: Fans of Deb Lucke's Lunch Witch will like this quirky, dark story but it probably will not have the wide appeal of, say, Kibuishi's Amulet series. Buy if you're looking for more graphic novels. I got to see a lot of new board books from little bee publishers at BEA last year, and this is one that went on my list for the engaging illustrations. The words are sets of verses on each page. Their quality varies - some have interesting imagery and some are more drab. For example, "When flamingos are young/they are gray or white./But when they grow up,/some turn pink - what a sight!" is pretty blah but "Hop, little sparrow./Getting clean is a must! One bathes in water - the other in dust." has a better ring to it, to my mind. The final spread has a lengthier paragraph of text talking about how birds are important to the environment and opens out to show a wide spread of different kinds of birds. 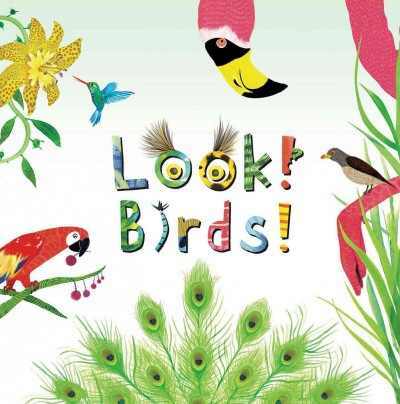 The real draw for me was the vivid illustrations of various birds, all performing different activities. The toucan grabs a fruit, with a nervous-looking worm peeking out while a frog watches from a nearby leaf. Tickbirds hop up and down a giraffe's neck, their beaks bull of bugs. A penguin splashes through the water in a white sea with accents of blue fish, a pink jellyfish, and a chunk of blue ice. The illustrations are smaller and more detailed, which along with the longer text will make this more suitable for older toddlers or younger preschoolers. The book is a sturdy 6x6 inch square and the pages are thin cardboard. Verdict: While this isn't necessarily a stand-out choice, if you're looking to freshen up your board book section with fun, new books with colorful illustrations this is a great addition. It's been popular in our library and I plan to purchase other titles in the series.